1. The boat shall be of single hull form, shall havea conventional hull design, and the construction may be of any material. Its maximum length will be twenty feet (excluding boomkin and rudder); its beam shall not be less than six feet (excluding rubbing strakes); and shall be a centerboard type. The centerboard shall not weigh more than 150 pounds. Grandfather Mermaid length was adopted as an exception for boat length permitting the boat to be 20 feet and 2 inches on March 21, 2007. 2. The boat shall weigh a minimum of 900 pounds for boats built up through 1988; 950 pounds for boats built after 1988. For weighing purposes, the boat shall consist of the hull, mast, boom, standing and running rigging, rudder, tiller, centerboard and the floor boards. All other equipment shall be removed before weighing. Any weight required to be added to reach the required weight is to be carried low in the boat, 1/2 in front of the trunk and 1/2 behind. Weight must be securely attached; glassed or bolted in. 1. Sails will consist of mainsail and jib only; spinnakers are not allowed. Sail cloth shall be none other than Dacron or other related basic material (no Mylar or Kevlar). Minimum cloth weight is 4.5 ounces for mainsails, 3.75 ounces for jibs. Sufficient tension shall be applied to the sail when measuring to pull the sail flat and remove any wrinkles. 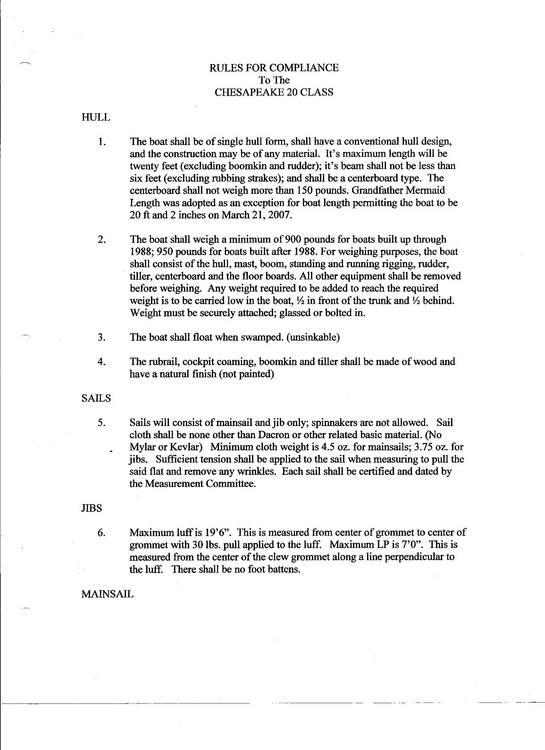 Each sail shall be certified and dated by the Measurement Committee. 1. Maximum luff is 19'6". This is measured from center of grommet to center of grommet with 30 pounds pull applied to the luff. Maximum LP is 7'0". This is measured from the center of the clew grommet along a line perpendicular to the luff. There shall be no foot battens. 1. Mast and boom shall be landed at gooseneck, top of mast and outer end of boom. The lower band at the gooseneck on the mast shall be located so that the top edge of the band is exactly at the level of the top edge of the boom. The lower edge of the masthead band shall be 29' 1/2" from the top edge of the lower band. The inside edge of the band on the boom shall be 12' 9" from the aft edge of the mast. 2. The mainsail shall never be set for any part of the head, crew, or tack to pass the inner limits of these bands. 3. The bands shall be painted on spars 1" wide, of contrasting color with the spar. They shall be applied at a 90 degree angle to the sail side of the spar. 4. Maximum length of mainsail leach is 30' 9". This is measured as a straigh line distance from the top forward corner of the headboard to the bottom edge of the cloth at the clew. The bottom edge of the sail shall project a fair curve. 5. Maximum length of the top headboard is 5.5"
6. All battens but the top batten have a maximum length of 50"
7. 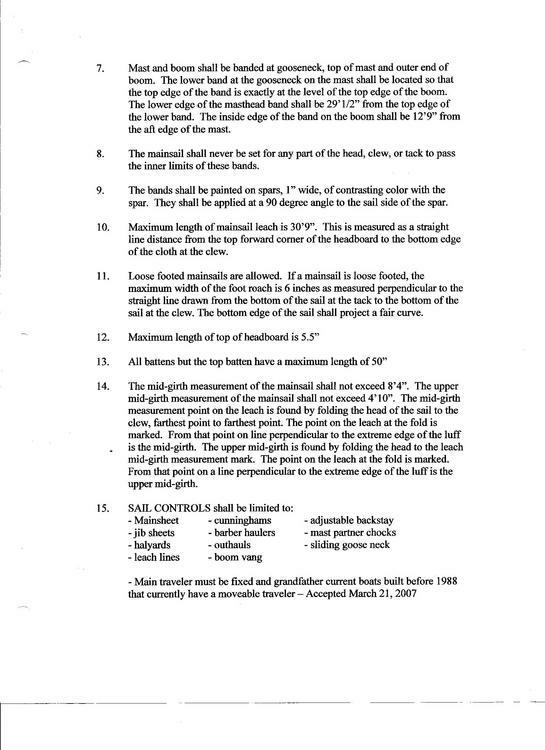 The mid-girth measurement of the mainsail shall not exceed 8'4". The upper mid-girth measurement of the mainsail shall not exceed 4'10". The mid-girth measurement point on the leach is found by folding the head of the sail to the clew, farthest point to farthest point. The point on the leach at the fold is marked. From that point on line perpendicular to the extreme edge of the luff is the mid-girth. 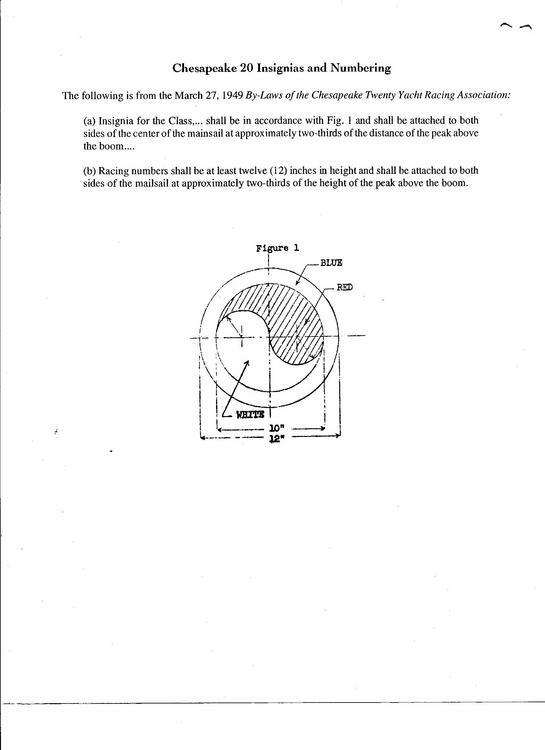 The upper mid-girth is found by folding the head to the leach mid-girth measurement mark. The point on the leach at the fold is marked. From that point on a line perpendicular to the extreme edge of the luff is the upper mid-girth. l. Main traveler must be fixed and grandfarther current boats built before 1988 that currently have a moveable traveler - Accepted March 21, 2007.
e. One additional preserver suitable for heaving. 2. 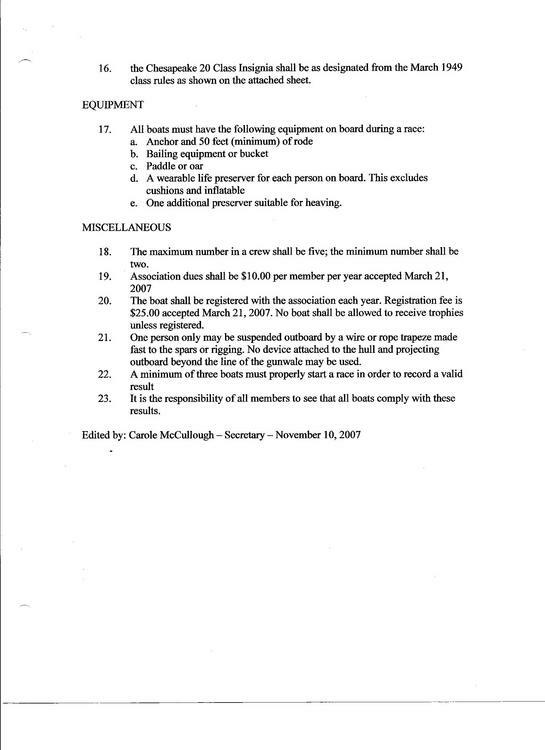 Association dues shall be $10.00 per member per year - accepted March 21, 2007. 3. The boat shall be registered with the association each year. 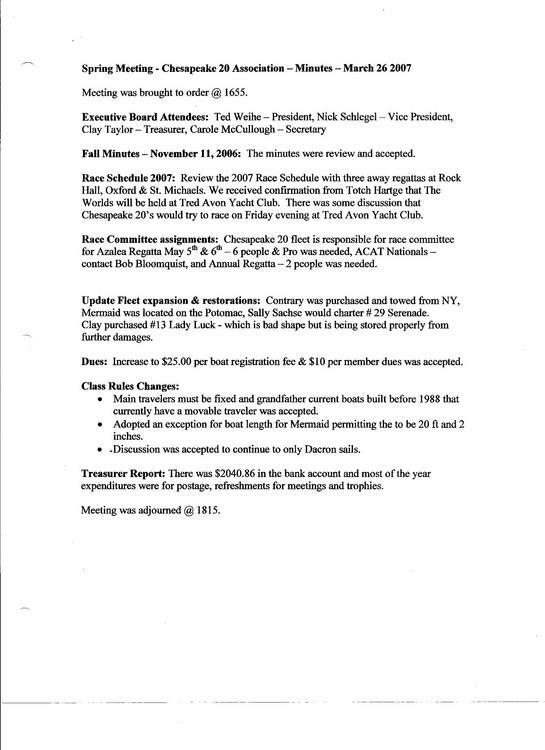 Registration fee is $25.00 - accepted March 21, 2007. No boat shall be allowed to receive trophies unless registered. 4. One person only may be suspended outboard by a wire or rope trapeze made fast to the spars or rigging. Ne device attached to the hull and projecting outboard beyond the line of the gunwhale may be used. 5. A minimum of 3 boats must properly start a race in order to record a valid result. 6. It is the responsibility of all members to see that all boats comply with these results.